I'm a big fan of American BBQ, specifically Texas-style. So when Dixie's BBQ opened up on East Hastings, I planned on heading out there after hockey one night. However, due to our constant late night league times on Fridays, the place closed before we could ever hope to get there. Finally, I couldn't hold on anymore and wait for an early game. Rather, I just decided to hit up the place with the family. Hey, I wanted the kids to get jacked up about BBQ as much as I do! 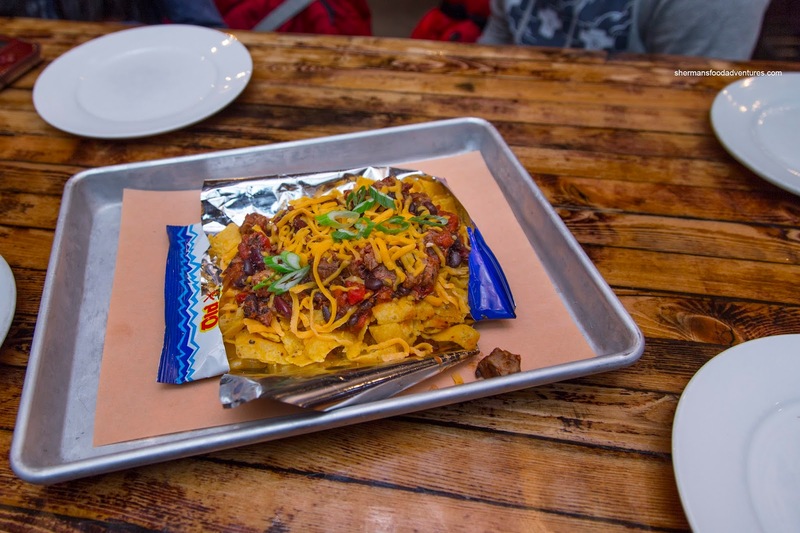 But before we got the festivities, I was confident that the kiddies would destroy the Frito-Pie. That they did since it was covered with a meaty chili consisting of chunks of brisket, tomato, onions and beans. The spice level was at a low-rumble and accented with a certain smokiness. Okay, the corn chips weren't Frito-Lay, but whatever, Old Dutch worked for us. I particularly loved the big chunks of tender brisket. 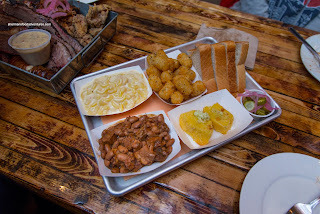 Seeing how we wanted to try everything, we went for The Bubba with smoked brisket, pork ribs, pulled pork, hot sausage link, fried chicken, country gravy, white bread, pickles and 2 sides for $35.00 each (for Viv and myself). 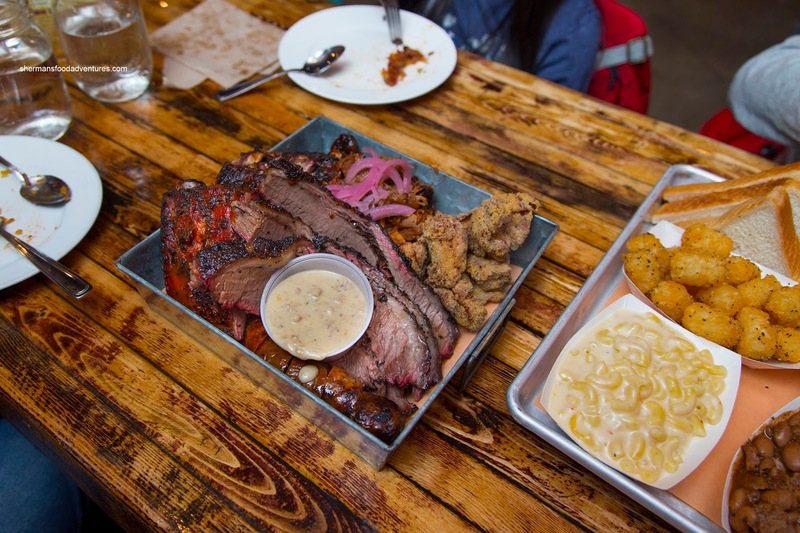 Just by eyeballing the meats, we knew they were on point. The brisket was fairly moist with a rich smokiness and a flavourful bark that was peppery and purposefully salty. Served in big chunks, the pulled pork was tender and juicy on its own without the need for any sauce. The same could be said about the pork ribs as they were actually juicy while sporting a smoky and peppery bark. I thought the sausage was pretty good too being meaty and firm with a definite hit of cumin. Lastly, the fried chicken was succulent while featuring crispy rendered skin that was also peppery and lightly salty. The side of country gravy was packed with sausage, making it robust and sinfully tasty. For our sides, we chose Tatar Tots, Brisket & Beans, Mac n' Cheese and Corn Bread (2 were part of The Bubba and we added 2 more). Of course, white bread and house-made pickles were included as well. Our favourite (especially with my son) was the mac n' cheese as it was creamy and had a nice sharp finish. The noodles were al dente too. Aggressively peppered, the tots were firmly crunchy while not super greasy. Similar to the chili but with less spice, the brisket and beans was hearty and had depth. We thought the corn bread was average not because it wasn't moist or flavourful, rather, it lacked a baked aroma. 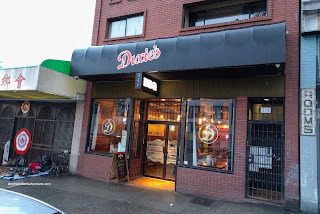 I often lament over the fact we can't get really good BBQ up in Vancity, but for me at least, Dixie's does Texas-style BBQ justice.